A homeowner's tale of a house built in five phases by a couple who overcame their fear of doing it all themselves. We began our first adventure in South Pasadena, California, where we spent four years restoring a 1912 bungalow home that contained wonderful examples of the Arts & Crafts style of architecture and woodworking. After 30 years of living in the Los Angeles area, the large-city lifestyle was getting to be more of a bother than it was worth. My wife Mary and I are avid fly fishermen. 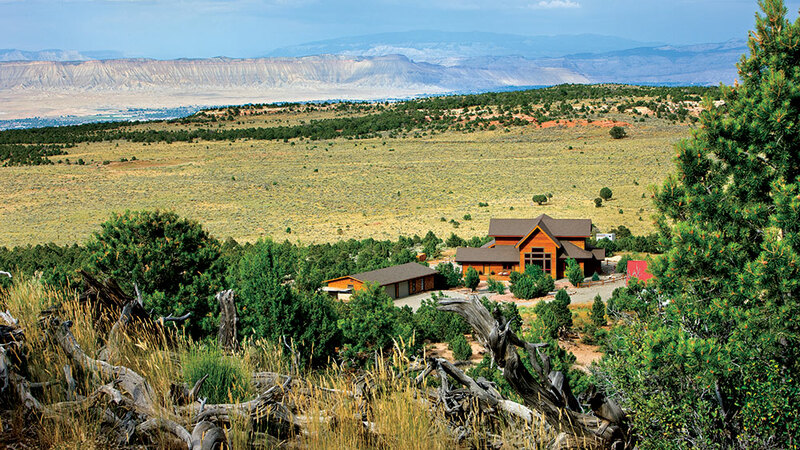 During our many trips to Colorado, our thoughts shifted to giving up the city life and moving to the country. After extensive homework we bought 35 acres of picturesque vacant land surrounded by breathtaking views, sold our California house, packed our belongings and moved to Colorado. The difference between restoring a house in the city and building in the country can be daunting. 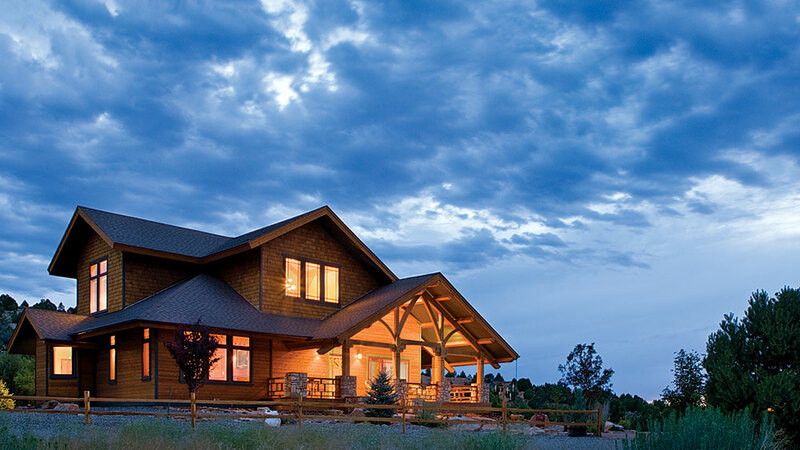 In the end, Mary and I spent the better part of four years building a two-story, timber-frame home along with a fully operational workshop and three-car garage with an attached media room. We built everything in the three buildings from scratch except the windows. We built the cabinets, the leaded-glass windows, the doors, the walls and the hand-pegged floors. We designed and built the driveway, the fences, the streambeds and the landscaping around the house. Tradesmen were used only for the major electrical and plumbing work. We also hired out the water well drilling, the cement stem walls and pads along with the major dirt work. We did all of the interior design, color selection, and woodworking ourselves, with the great minds of the Arts & Crafts movement as our guides. Charles and Henry Greene, along with Gustav Stickley and many of the architects and builders who practiced their trades in the early 1900s. We freely interpreted their work to fit our own personal likes and dislikes. Frank Lloyd Wright window designs can be found throughout our house. To build the house we had to live on the site, so we purchased a travel trailer and towed it up to our empty land. We then started our search for a supplier of timber-frame building materials. Almost from the beginning we knew that we were going to be the builders. This was a much bigger decision than we realized at the time. In the days to come, we often questioned the decision. But now as we look back at the entire project, we are both convinced that the decision was correct. “We did it ourselves” has a sweet ring to it. 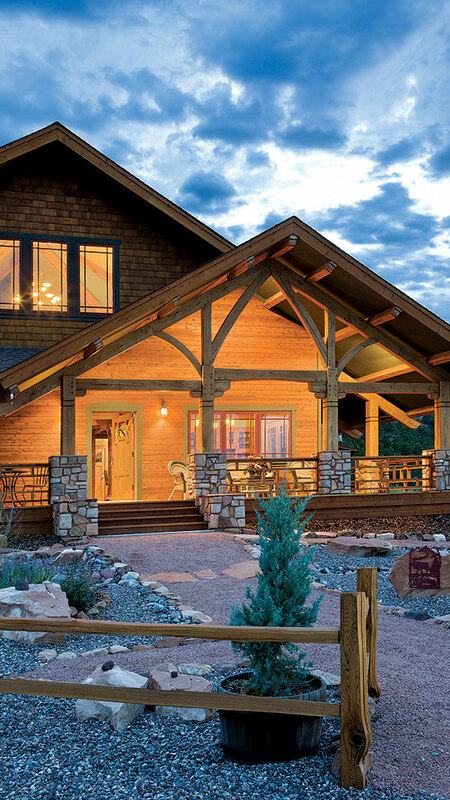 Our search for timber frame material suppliers was narrowed to only those companies that provided a wide selection of services known as “one-stop shop.” All of our requirements were met at Riverbend Timber Framing, which went out of its way to make sure that we were happy and satisfied. Then we began phase one of construction. We can still remember that wonderful feeling when that first truck carrying the timbers appeared on the road at the bottom of our hill. Three trucks later, we asked ourselves: Where did all those pieces fit into the house puzzle and how are those giant oak beams going to stand up in the air and support the walls and floors? The Riverbend representative took control, and in a short time the beams went one place in a certain order and the panels were stashed somewhere else, also in a certain order. The next day we reviewed the plans and before we knew it, the first bent was lifted into place by the Riverbend crane. For the next four days we were amazed how fast and smooth everything went. At the end of the five days, the entire frame was raised, and two of the exterior walls were up and secured. At this point the Riverbend advisor and all of our friends returned to their other lives. The sixth day was a memorable one. We woke at 6 a.m. By 6:30, we realized that it was now up to us to complete the house. We were looking at wooden beams sticking in the air, some panels attached and a lot of materials still sitting on the ground. The whole structure resembled the framework of a giant cathedral. We looked at each other with terror in our eyes. We had both done a lot of things in our lives, but nothing even came close to what we were looking at right then. After a few more cups of coffee and some advice from our neighbors who had gone through a similar experience, we started on what was to be the journey of a lifetime. Phase two was the installation of heating, plumbing, electrical and gypsum-board walls—most difficult to easiest in that order. In phase three we selected colors, which turned out to be easy for us because we used the Arts & Crafts palate of colors and in the end stuck pretty much to what had been in our previous home. Phase four — cabinets and floors — lasted almost a year, so it was not only the most time-intensive but also the most expensive. We built the cabinets onsite using maple and cherry, with a Greene-and-Greene inspired cloud lift pattern on the bottom rails. The upper-cabinet doors included leaded-glass panels made by Mary in a Frank Lloyd Wright-inspired design. Floors were four-inch oak planks with walnut trim. We decided to build a staircase based on designs in two famous Greene-and-Greene homes in Pasadena, and used another Greene-and-Greene home, the Thorsen House, as the design for our front door, which includes stained glasswork by Mary. The distinctions for our construction phases began to blur at this point. During summers we did exterior work. In the snowy Colorado winters we worked inside. The last, and most difficult, phase was the interior trim. 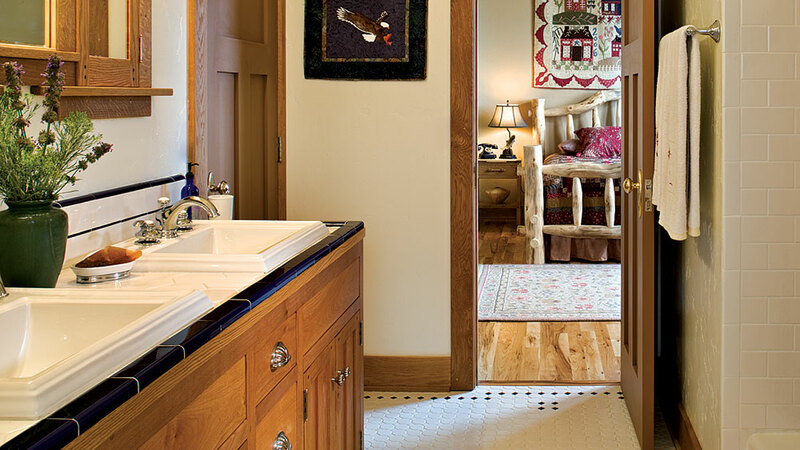 Using Arts & Crafts style as our guide, we installed six-inch baseboards, and four- and five-inch window casings made of white oak and maple. It took many months and hundreds of board feet of lumber. Just as with the classic bungalows of the early 20th century, our trim work pointed the way to completing the project, and was meant to bring the outside in. When the sun drops behind our hill at the end of the day, when all of the birds and wildlife settle down for the night and the wind is still, we sit on our front porch and wonder where our journey will take us next, now that our house is completed. 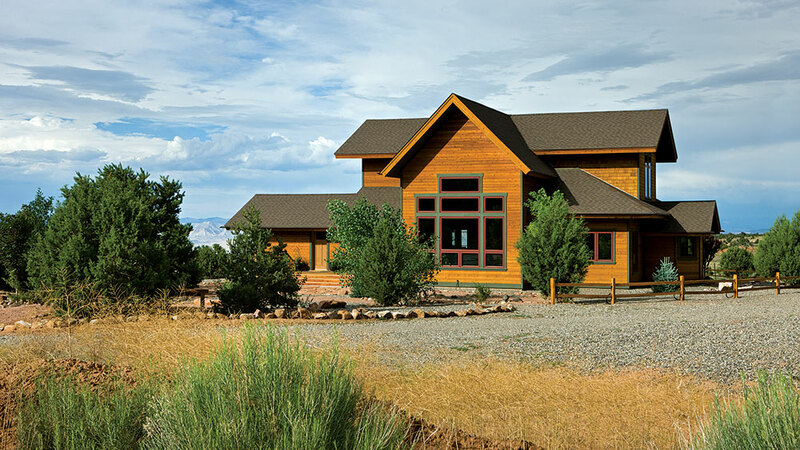 Fly fishing originally brought Tom and Mary Reamer to Colorado, where they discovered a 35-acre site that fit their new home needs. The Reamers had remodeled a 1912 Arts & Crafts bungalow in Pasadena, California, and sought to incorporate similar architecture and furniture in their Colorado timber-frame home. 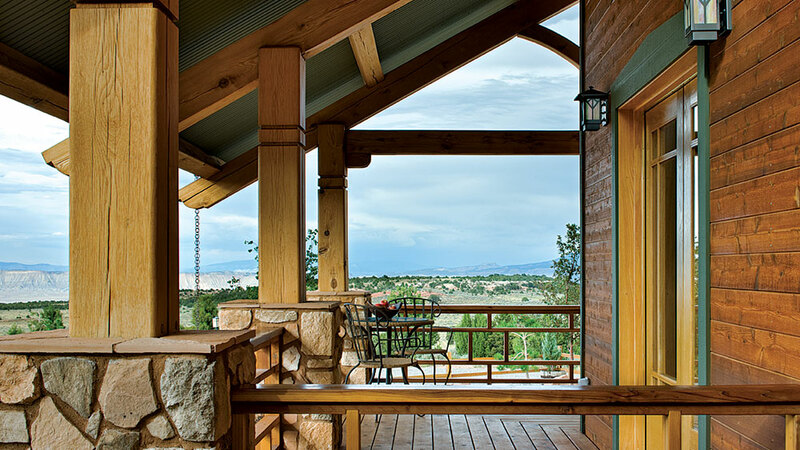 Outside the entry door, the covered porch looks out over the Reamers’ 35 acres of Colorado countryside. The stone foundations for the timber supports are similar to those found on Arts & Crafts bungalows built early in the 20th Century. 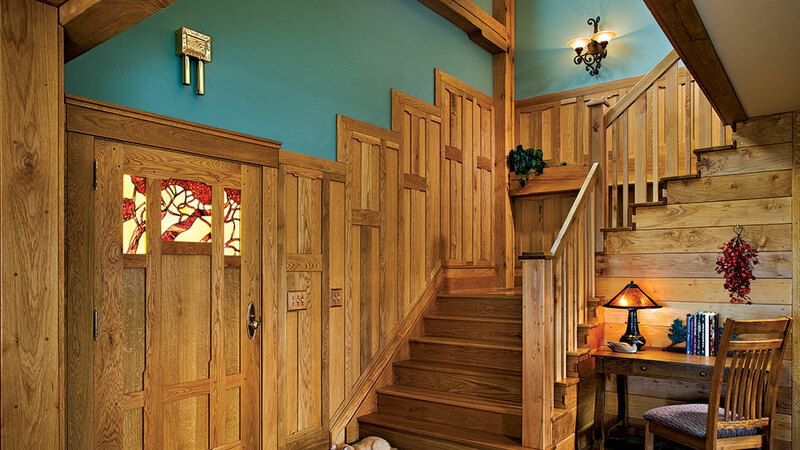 Inside the entry, frame-and-panel oak wainscoting shows the way to the second floor of the 3,237-square-foot home. Mary Reamer made the Arts & Crafts style stained-glass windows and the couple did virtually all of the trimwork inside the home. The large stacked windows that cover one wall of the great room are a distinctive feature that can be seen for miles outside the Reamers’ home. 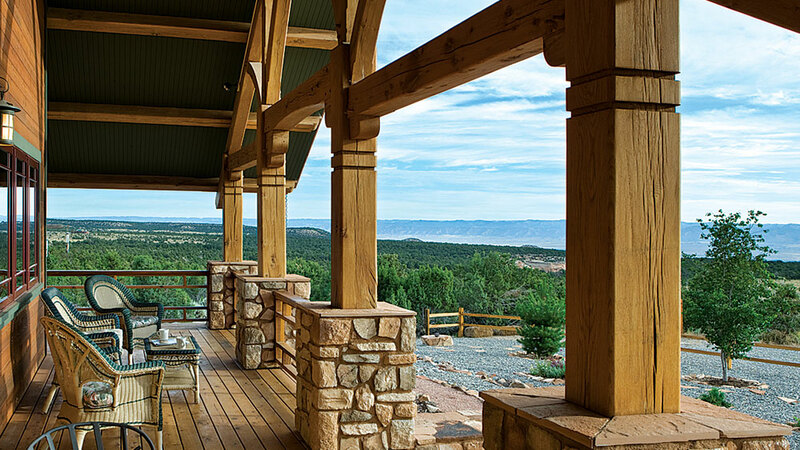 The home has views of Mount Garfield, Colorado National Monument, Grand Mesa and Pinon Mesa. 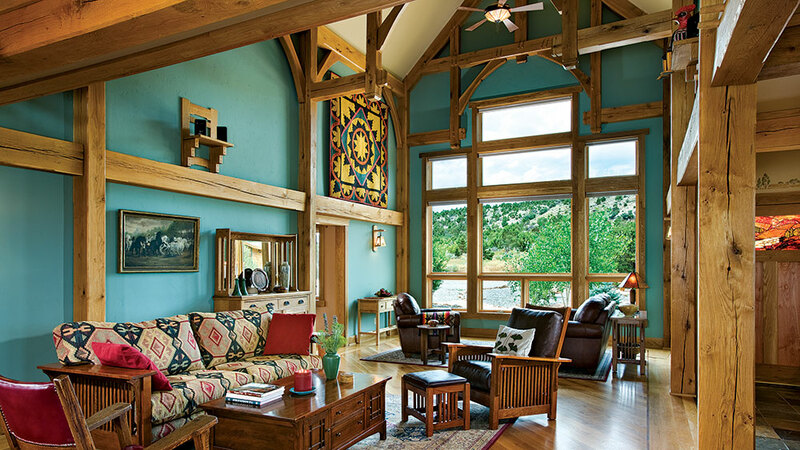 The great room looks southwest and features spruce green walls, large oak timbers, a diagonally laid oak floor inside a walnut border and several pieces of Arts & Crafts-style furniture. 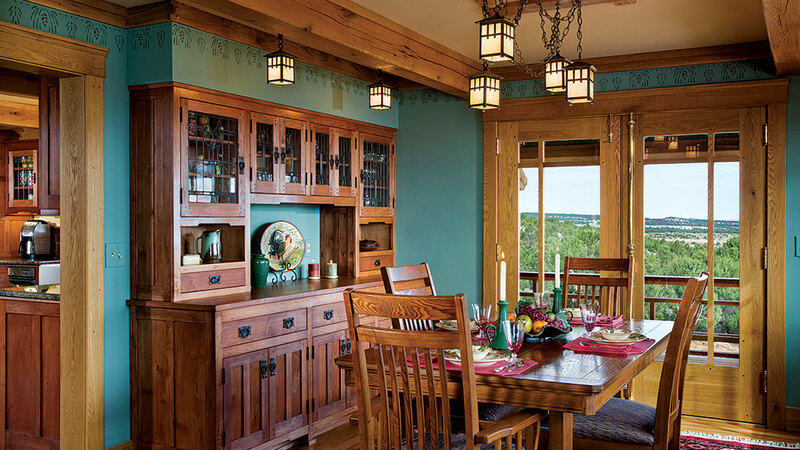 The dining room with a large built-in Greene-and-Greene style hutch and Arts & Crafts light fixtures opens on to the covered porch that wraps around two sides of the house. The three windows of the second-floor master suite face northeast and look out past the covered entry porch below. 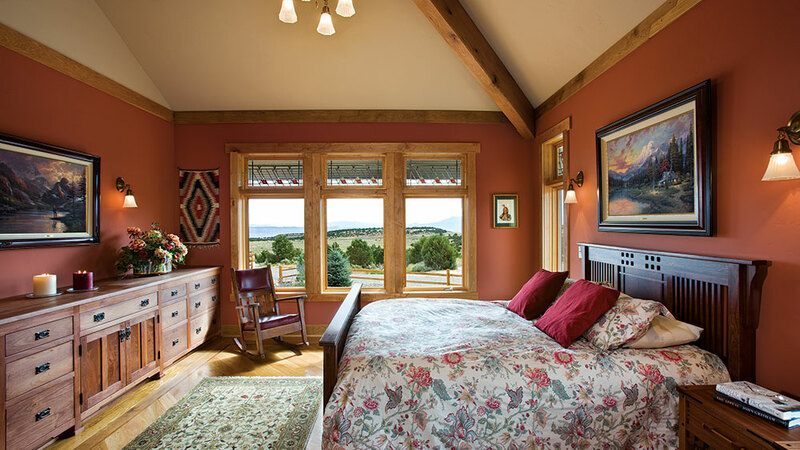 Inside, the Greene-and-Greene and Frank-Lloyd-Wright inspired built-ins, rocking chair and bed frame complement the dramatic art and the Roycroft Adobe-colored walls. 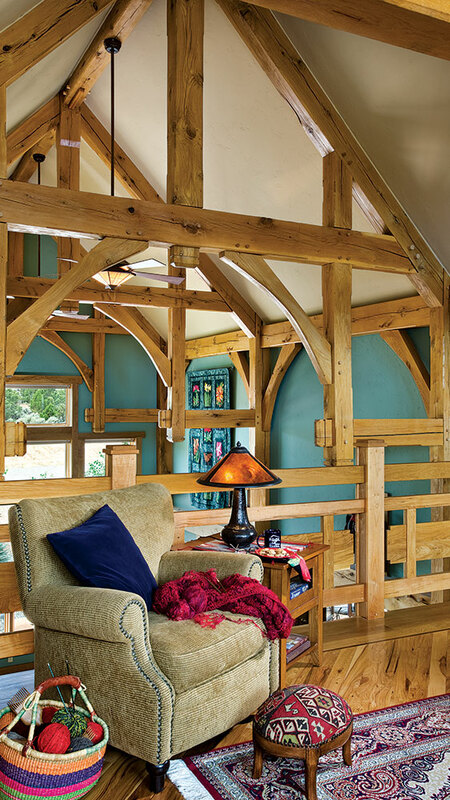 Tom Reamer made the built-ins and the couple installed all of the trim. Mary Reamer made the stained glass. In the master bathroom with views in two directions, U-shaped, granite-topped built-ins are set off by slate tiles on the floor. 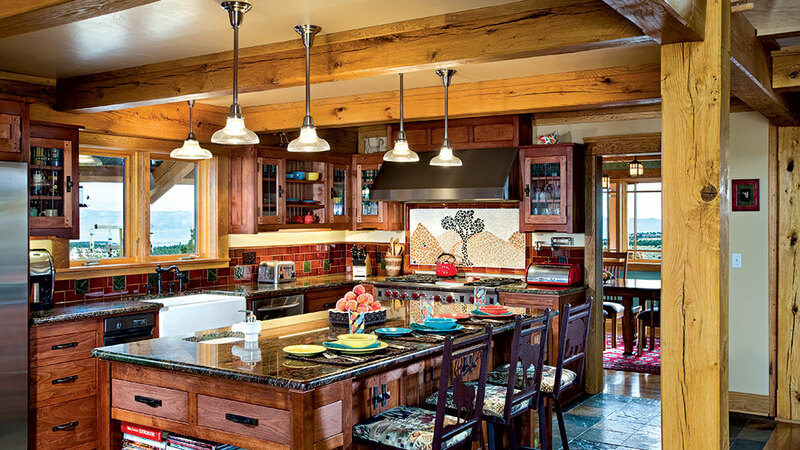 The large kitchen features a commercial-style stove, old fashioned sink, Arts & Crafts-style tile on the backsplash and a granite-topped island that is large enough to seat three or four for casual dining. The Reamers made the interior trim from white oak, cherry and maple. 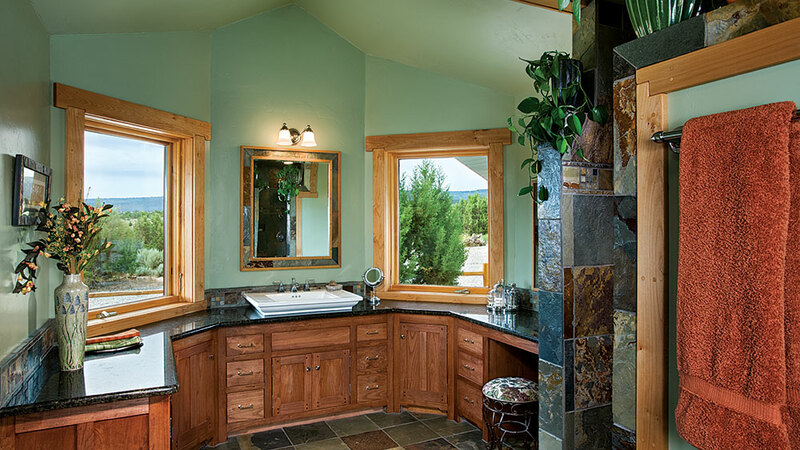 Here white oak doors and casings match the medicine cabinet, mirror and built-in vanity also made of white oak. The light color of the wood and the white walls and tile are set off by the dark wall art and the dark edging on the countertop. 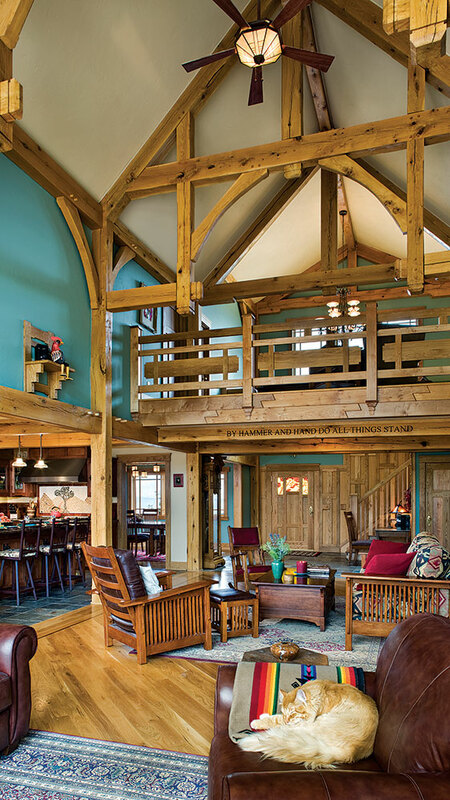 The sitting-room loft offers a close-up view of the white oak timber trusses that mark the cathedral ceiling of the great room below. A hickory floor laid at a 45-degree angle is set inside an oak border, much like the floor in the great room. Outside, a lighted and covered porch welcomes visitors and a truss mimics the large trusses inside.